Lucerne, Switzerland, 28 July 2016 – SubReader has excelled in the European competition, after impressing the judges with their strong business concept. Their app helps dyslexic people to read subtitles on international TV and movies aloud. It operates independently of TV or other media and does even not require any setup. Over 200 students gathered in Lucerne between 25-28 July to celebrate the top mini-companies from across Europe. 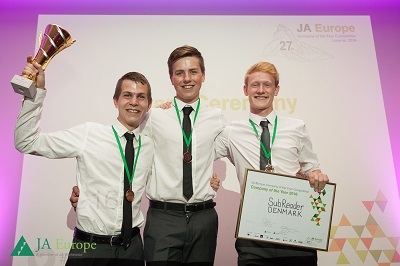 36 student-teams competed as part of JA Europe’s flagship JA Company Programme, which gives them an opportunity to set up and run a real business. “We are very proud to win the main Company of the Year Competition this year. This prize rewards the huge amount of works we have dedicated to this new business. Competing here in Lucerne was mind blowing. It was fantastic to meet peers from across Europe, to learn from them as well as from the jury members,” shared the three team members. • 'AT&T Excellence in IT Award' recognises the student-company that demonstrates the best innovation-driven concept, with strong business potential and sustainability, as well as viability and scalability. • ‘Citi Client Focus Award’ recognises student enterprise that excel at creating value for their clients, listening to their clients and walking in their shoes to understand their world, anticipating and serving their changing needs. • ‘FedEx Access Award’ is given to a JA student company which has the most comprehensive understanding of global trade and related concepts. The students must show they grasp the global nature of today’s business world. • ‘MetLife LifeChanger Award’ recognises student companies which best embraces the concepts social impact, financial performance and innovation in their business strategy while remaining a realistic plan in today’s marketplace. Young Enterprise Switzerland is a non-profit organisation which develops and supports practice-oriented business training programmes for students, with the aim of interlinking the economy with schools. The Company Programme was first run in Switzerland back in 1999 and the first volunteer placements took place in 2003.